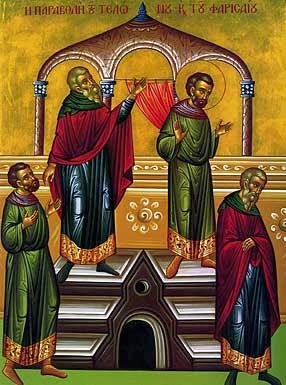 Today is the Sunday of the Publican and the Pharisee, which also marks the beginning of the Lenten Triodion. Next week is the Sunday of the Prodigal Son, and after that we will have Meatfare Sunday, then Cheesefare Sunday, with Great Lent beginning the day after Cheesefare Sunday. The more time I spend in the Church, the more I look forward to Great Lent. At first, I was very apprehensive. We had never fasted very strictly, and the ascetic discipline demanded of us seemed overwhelming at times. But as time passes, I grow to appreciate the fasting seasons. Yea O Lord and King, grant me to see my own sin and not to judge my brother, for Thou art blessed unto ages of ages. Amen. As Great Lent approaches this year, I wish each of you a season of love for God and neighbor, and of hope and peace. May the prayers of the most Holy Trinity be with us as we approach Christ's Pascha.